I may be biased, but I believe that we may have outdone ourselves with this newest cake! 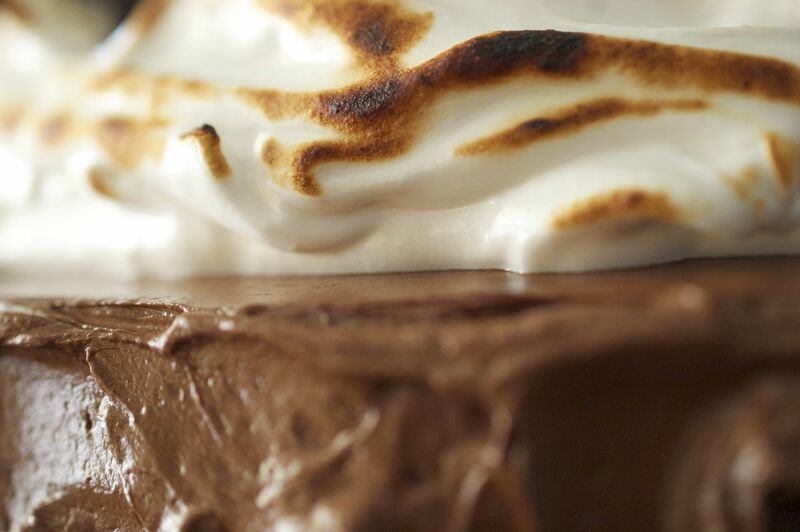 This Devil’s Food S’mores cake came about while dreaming about summer, which obviously is gone… and with Thanksgiving now over, won’t be back for at least another 6-9 months. New England weather… so unpredictable! One day we were browsing our favorite food blogs and Pinterest boards when we saw a rendition of this cake. So we went on a hunt for a recipe that didn’t use corn-syrup or marshmallow fluff. We also wanted to play down the graham cracker part of the s’more, because let’s be honest here, it is all about the chocolate and marshmallow. The graham just holds it together and adds that desired crunch you may be looking for. As far as we could search, no recipe existed that met our high standards. Certain recipes had half of what we were looking for but not the whole package. So, we took it upon ourselves to find the best combinations and create our ULTIMATE s’mores cake. And in my opinion we hit it out of the park! 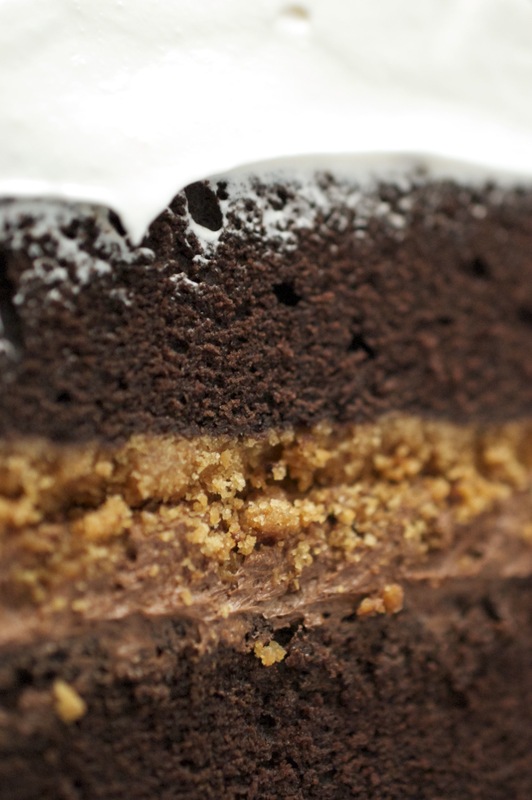 We used our new favorite Devil’s Food chocolate cake recipe (adapted from Rose Levy Beranbaum’s Devil’s Food Cake recipe) and made a graham cracker layer, that was baked right in. Our dark chocolate buttercream frosting, that is so decadent it should be a torte on its own, wrapped this cake in rich chocolaty heaven. Last, but certainly not least, a homemade marshmallow frosting, with no corn syrup (YES! ), which is piled high on top and lightly toasted. This cake is a looker! It does have multiple steps in baking and could look overwhelming. But if you have been in the kitchen before it’s nothing you can’t handle. Take it a step at a time an you will breeze right through, and the results will have your friends and family praising you as the S’mores Cake Queen… or King! Prepare two 9" spring form pans, greasing the pans with cooking spray and line the bottoms with parchment. In a medium bowl whisk together cocoa and boiling water until smooth, cool to room temperature. Meanwhile, prepare graham cracker layer by mixing ground graham crackers with sugar and melted butter. Press into the bottom of one spring form pan, set aside. In a separate bowl lightly combine eggs, ¼ of the cooled cocoa mixture, and vanilla. Set aside. In a stand mixer combine the remaining dry ingredients and mix for about 30 seconds. Add butter and remaining ¾ of the cooled cocoa mixture, mixing on low speed until dry ingredients are moistened. Increase speed and beat for 1½ minutes, scrape down sides of the bowl. Gradually add the egg mixture to the batter in 3 batches, beating for 30 seconds after each addition to incorporate each addition completely, scrape down sides of the bowl. Pour batter into prepared spring form baking pans. Bake for 35-45 minutes or until tester inserted in center comes out clean. Allow to cool for 10-15 minutes before moving to cooling rack. Assembly: Allow cake to completely cool before assembling. 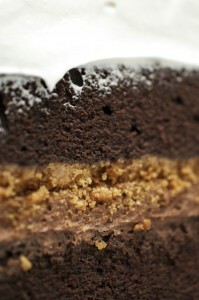 Place layer without graham cracker on plate, level the cake by removing the domed top with a knife. Save shavings for filling cracks, or snacking. Fill with chocolate buttercream frosting and spread so there is a layer about ¼ - ½ of an inch thick. Trim second cake, as you did with the first before stacking. 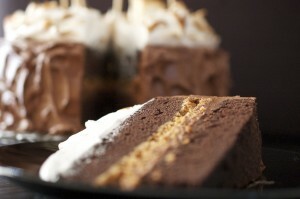 Place second cake, graham cracker side-down to the center of the cake, on top of frosting. Continue to frost the cake with the remaining buttercream frosting trying not to press hard on cake to avoid frosting oozing from center. If room is too warm you may want to refrigerate the cake to stabilize the frosting while assembling the cake. Pile marshmallow frosting on top of cake, making fun patterns in marshmallow. 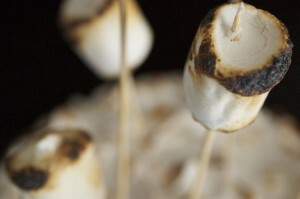 Use a long stemmed lighter, or blow torch, to brulee/toast the marshmallow, being careful not to burn the marshmallow. 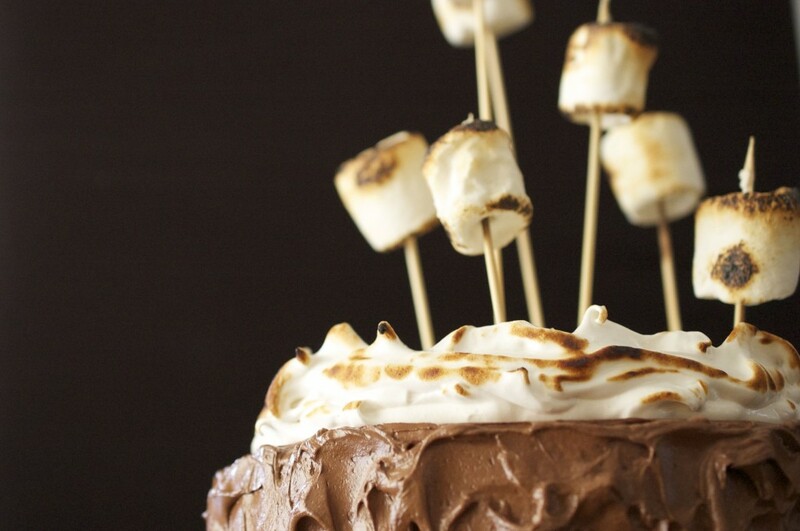 You may want to practice on a spoon of marshmallow before toasting the cake. Only way to know for sure is to bring one in for me to taste test. I promise it will be a rigid scientific controlled test. Can you make this cake one day ahead. How do you store it? We made this the day before serving and left it at room temperature – storing it in a cake carrier with lid. If you live in a warm climate, or you don’t plan on eating it the next day, I would recommend making the cake and chocolate frosting, assembling ahead of time, and refrigerating – but wait to make the marshmallow frosting until the day of serving. Made cake. Excellent. 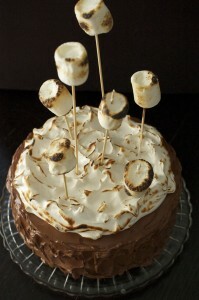 Did find that the marshmallow layer although stiff didn’t fluff up as in your picture. Perhaps, affected by weather — in midst of huge snowstorm. Glad it turned out yummy! Weather can definitely affect egg white based fillings and toppings, so I am not surprised. Also, it can get stiff quickly, so spreading it or dolloping it on top as quickly as possible after making it can help as well depending on your circumstances. This looks delicious! How many people does this serve? I want to make this for a party (12ppl). Think if I cut slices thin(ish) it’ll work? Hey Janie – Sorry for the delay, hopefully it isn’t too late! I think that this cake would be fine for 12 people, but like you said, cut thin slices. Since it is very rich it shouldn’t be too much of a big deal if they don’t get a HUGE piece! This looks great! Just one question–how do you get the graham cracker crust layer from the pan onto the next layer without crumbling it everywhere? All I can envision is a mess! We used springform pans lined with parchment paper and poured half of the cake batter on top of the pressed graham cracker. We used the bottom of the pan to trace the circle on the parchment and then cut it out. Once out of the oven and cooled we used this layer as the bottom of the cake by flipping the cake over, so that the graham cracker layer was on top. The spring form pan is a definite must for this, so is the parchment paper! Thank you for the question and enjoy! If all you can find is ground espresso try running it through a food processor for a little bit until the consistency is close to cocoa powder. I can’t wait to try this! Do you separate the batter equally between the two pans? Also, a normal hand mixer should work as well, right? Thanks so much! Separate the batter as equal as possible between the pans, and yes, a hand mixer should be fine… Just a little more of a work-out! Enjoy!